Hi! We are Lee and Jonathan and we are Userback. We’re just two mates with a passion for speed, accuracy and pixel perfect! We love cars, playing 8 ball and great design. Helping you be fast, accurate and pixel perfect makes us happy. There are many methods to collect feedback however, we truly believe that through visual feedback and its ability to articulate ideas or provide context to problems, you can build better products, you can create a better experience for your customers. Better experiences, faster websites, more accurate apps and happier people means more customers. Customers that will stay longer and customers that will be more likely to refer. Userback facilitates this relationship by connecting your people through feedback and collaboration. We’re excited to be part of your business, your process and we’re excited to start helping provide context to your feedback. We can’t wait to turn your visual feedback into something meaningful, learn more about your business and build pixel perfect together. 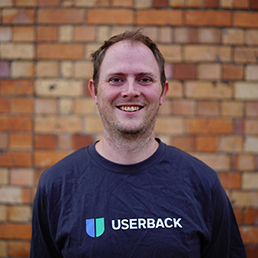 Join thousands of product managers, developers, designers already using Userback!